Jazz, film, and improvised culture. With a name like that, there is only one thing he could be: a corrupt cop—or at least semi-corrupt. Regardless, he will fix himself up real good in Josh C. Waller’s McCanick (trailer here), which opens this Friday in New York. It is Eugene “Mack” McCanick’s birthday and he hopes to celebrate at a bury-the-hatchet dinner with his estranged grown son. However, he is thrown off stride when he learns Simon Weeks has been released from prison. The former street hustler was involved in the murder of a congressman. Strictly speaking, he probably was not the killer, but McCanick sent him up the river anyway. Now that he is out, McCanick is determined to keep him permanently quiet, without compromising his promotion-track partner. Needless to say, things get ugly quickly. Basically, we already know exactly what to expect from McCanick the character and the film, but David Morse plays his grizzled angst for all its worth. Right from the start, he vividly expresses McCanick’s tragic rage and weary resignation. Beyond his considerable size, he truly has a cop-like presence. In contrast, the late Cory Monteith’s turn as Weeks suggests he was probably better served by television’s smaller frame. Still, he looks reasonably credible in this vice-ridden milieu. In contrast, Ciarán Hinds sounds ridiculously out of place as the crusty veteran Philadelphia police captain, but at least as an old pro he knows how to command the spotlight. Evidently, McCanick is a period piece, since a now shuttered Borders store can clearly be seen in an early street montage. It is also rather hard to believe a broken down copper like McCanick could careen across the city, wreaking havoc on his colleagues with such relative ease. Still, Waller capitalizes on the gritty Philly locales, if not exactly doing a lot of favors for the city’s tourism campaign. Waller cranks up the hardboiled vibe to eleven, but the film’s only real mystery turns out to be pretty underwhelming stuff. Morse does his thing and Waller adds plenty of local color, but the end product is just fatally okay. 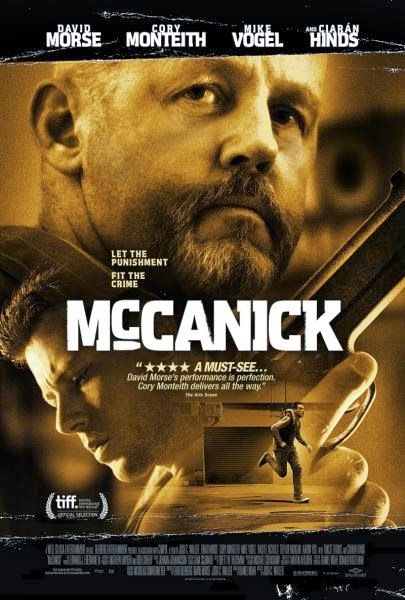 Recommended for fans of the cast with a taste for naturalistic cop dramas, McCanick opens this Friday (3/21) in New York at the Village East. J.B. (Joe Bendel) works in the book publishing industry, and also teaches jazz survey courses at NYU's School of Continuing and Professional Studies. He has written jazz articles for publications which would be appalled by his political affiliation. He also coordinated instrument donations for displaced musicians on a volunteer basis for the Jazz Foundation of America during the aftermath of Hurricane Katrina. Send e-mail to: jb.feedback "at" yahoo "dot" com. Jodorowsky’s Dune: If Only . . .